Looking for a counsellor or therapist? We’re here to help. Deciding you’re ready to see a counsellor can be hard, but once you’ve decided to undertake private counselling, how do you choose which professional to go with? There are so many factors that can affect our choice and, in an unknown territory, it can all feel a little overwhelming. To help make the process easier, we’ll walk you through how to use our search tool to find the right counsellor for you. While we shouldn’t solely rely on someone else’s experience (as everyone will have their own preferences when it comes to qualities of a professional), it can be a good method to help you find a therapist. Particularly if you know someone who has already been through therapy, ask them about their experience. What did they think of their counsellor and do they have any advice for you? If they had a positive experience and would recommend their counsellor to you, you can use our Site Search (which you can find in our top toolbar) to find their name. Much like when looking for a new job or a new home, you need to decide on the factors that are essential, and which ones you can afford to compromise on. Are you looking for someone that is close to home? Or someone based near to where you work? Would you prefer one-to-one sessions? Or are you looking for group therapy? Would you prefer to work with a therapist of a particular gender? Is this counsellor for you? Are you looking for a professional to help somebody else? Is face to face counselling comfortable and/or convenient for you? Would you prefer to receive therapy online or via the telephone? These factors can affect your search criteria, so it’s worth knowing exactly what you’re looking for before you commence your search. If you’re unsure about your answer to any of these questions, counsellor Matt Fox provides some guidance for five common counselling questions. To search for professionals in your area, enter your full postcode. You can then use the distance filter to increase the search area, depending on how far you are able to travel. Lots of counsellors and psychotherapists offer online and telephone counselling if you’d rather not see them face to face. To search for a counsellor or therapist offering these services, use our online and telephone searches. Most people that start counselling have something in particular that’s causing them difficulties, whether it’s anxiety, stress, depression, grief, relationship issues, or something else. For others, it can be a feeling of uncertainty – something about how they’re feeling just isn’t quite right. If something specific is bothering you, or getting in the way of living your life, you can use our search to find a counsellor that can specifically help with that area. When deciding on the right counsellor or therapist for you, it can be useful to understand the different therapies they may use. While all can be effective, you may find one approach more appealing than another, or find that some approaches are better for a certain area of counselling than others. Particularly if you’ve had counselling in the past, do you know the type of therapy your counsellor practised? What did you think of their approach? It can be useful to know this information before embarking on your search this time around. Remember, there is no ‘fix-all’ approach, it will depend on you, your situation and the therapist. So, unless you have a firm preference for one of the approaches, it may be best to have an initial session and to focus on how comfortable you feel with your therapist, before making up your mind. If you click on a counsellor’s name you can find out more about them, along with their contact details and fees. You’ll notice some organisations are listed below the individual counsellors too, some of which may also be able to offer you support. As you may have already noticed, there are many different terms out there to describe professionals working in the mental health industry – from psychiatrist to psychologist, from psychotherapist to counsellor – and each professional can help in different ways. Understanding the key differences between these professionals and how they can offer support should help you decide which one is right for you. Our counsellors list a lot of information on their profiles and it can be helpful to notice some of the extra features that can help you find what you’re looking for. Within a counsellor’s profile, you can find out more specific information about their qualifications and experience, as well as what they can help you with. They may provide more guidance about their areas of speciality and how long they have been helping clients within these areas. Remember, if they have been working in the area that you are looking for help with for some time, they are likely to have built up a solid knowledge base of what is most likely to help you. Once you’ve narrowed down your choices to a few professionals who fit your criteria and who you get a good ‘feel’ for, the next step is to approach them. Some people get nervous about this. Don’t worry, a counsellor is just another person, the same as you. A good counsellor will always make five or 10 minutes to chat with you about what you might need and to answer any questions you might have. But don’t feel you have to make a decision right away. You can think it over and give yourself time to compare other counsellors. When searching for a counsellor, one element that is just as important as the above factors (if not more so), is trusting your gut instinct. Trust your initial reaction and choose who you feel drawn to. Your connection with this person is vital. It’s important that you feel that your therapist understands you personally and cares about your well-being. It’s equally important that you feel comfortable talking to them about what might be bothering you, so good rapport is key. Try to establish this on the phone or via email before your first appointment, if you can. Whichever counsellor you opt to see, remember that you can ask about their training and experience before your first session. This includes confirmation of their up-to-date professional body membership and professional insurance – as well as evidence of any relevant qualifications. It’s perfectly OK to ask for clarification if there’s something you don’t understand. This can give you peace of mind before you commence the therapeutic relationship. If the first professional you reach out to isn’t quite right for you, please don’t give up. There are many different branches of counselling, and each practitioner will often have different techniques and approaches, so if you don’t have success with one at first, it is always worth trying someone else who uses a different approach. 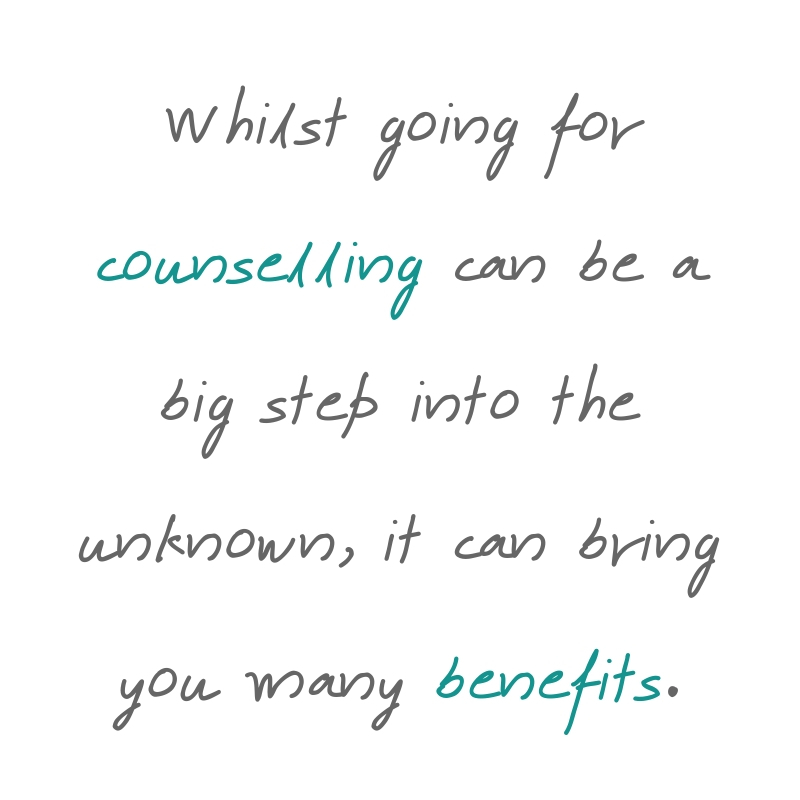 Whilst going for counselling can be a big step into the unknown, it can bring you many benefits; feeling better about yourself, improved connection with your family and friends, reduction in your stress levels, improvement in your physical health, and a better understanding of your own thoughts and feelings – the benefits are endless. We know it’s daunting when you’re not sure where to start. We’re here to help.